The Pro Series Training Bumpers are one of the newest additions to our WORLD CLASS bumper plate family. Using a special blend of our special formulated virgin Class A rubber and synthetic blend materials, the Pro Series is able to withstand heavy use in multiple training venues. Lower cost and durable, these plates are perfect for high schools, colleges and performance centers on tight budgets but wanting quality equipment. 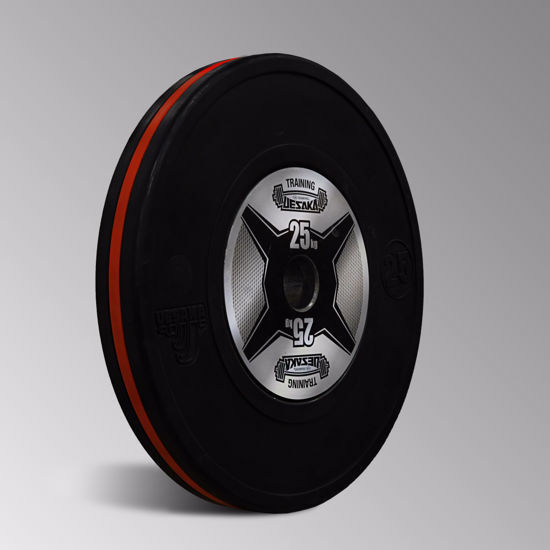 All Pro Series Bumper Plates come with our exclusive rubber infused rubber color band markers on the top rim surface for added identification of correct weight selection. The Uesaka Pro Series use many of the same high quality products and design of our other International Bumper Plates. They are identical to our competition line, but do not undergo the additional calibration necessary for official use. Our Pro Series Training Bumpers come with a 4 year warranty and is one of the best in the industry for a mid-range quality bumper plate.